H.O.M.E. missionaries are equipped for personal spiritual strengthening using a proven approach. Through DAILY HABIT FORMATION, experience and expertise in the spiritual disciplines of prayer, Scripture reading, journaling, meditations, fasting, etc. are developed. 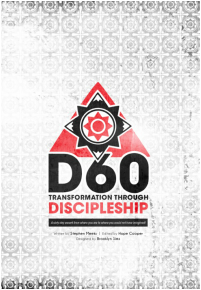 The book D60: Transformation through Discipleship serves as the core text for this training. A common mistake is to assume that missionaries are involved in what will keep them spiritually growing and strong. Too often, missionaries are not practicing spiritual habits necessary for their longevity on the field. They often fail to thrive, because they do not have these habits active in their daily schedule. GoodSoil's two week H.O.M.E. program is a boot camp for the development of spiritual discipline--making sure your missionaries are equipped for personal spiritual success.